The newest heartthrob in town, Bilal Ashraf has opted out of Urwa Hocane and Ali Azmat starrer Jhol. He revealed the news on his Facebook page. A local publication asked for the reason, however, Bilal Ashraf refrained from sharing any details. Jhol is a romantic comedy film directed by Shahid Shafaat. The film stars Urwa Hocane as a businesswoman while Ali Azmat plays the role of an Ayaash cop. 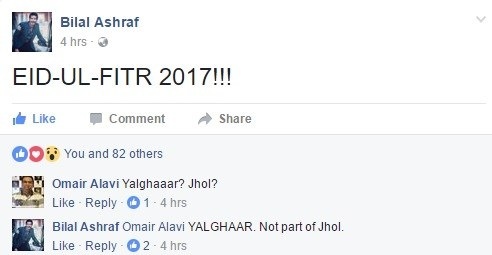 Bilal Ashraf was supposed to play a pivotal role in Jhol.